Espoo, Finland - Nokia today announced the availability of the largest, most comprehensive line of connected consumer health products in the market. 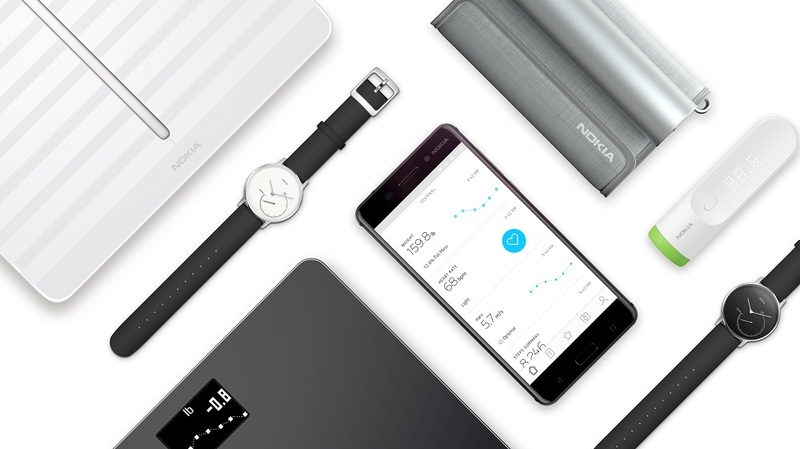 Completing the transition of products from the Withings brand, Nokia trackers, scales, vital health devices and home products will now be available in-store and online through top retailers. "Nokia's global expansion into digital health builds on Nokia's unmatched track record of quality, reliability and trust, which are characteristics that are all critical to success in the health industry," said Brad Rodrigues, interim president at Nokia Technologies. "The products are beautiful, easy to use and fit seamlessly into people's daily lives, enabling individuals to easily monitor and improve their health." The Nokia digital health product line offers convenience, choice and accessibility for every lifestyle. From those desiring a healthy change without a drastic behavior overhaul, to those looking to maintain a healthy lifestyle, Nokia meets the widest range of consumer health needs. New products announced today include Nokia Body, a BMI Wi-Fi connected scale, and Nokia BPM+, a compact blood pressure monitor with a flexible cuff. The redesigned Nokia Health Mate app functions as the heart of the ecosystem by giving users a 360-degree view of their well-being. "Nokia's line of digital health products delivers actionable insights, giving users the equivalent of a daily check-up," said Cedric Hutchings, vice president of Digital Health at Nokia. "Today's launch extends the accessibility of our products to a broader range of users and needs, giving families the personalized experience they need to live healthier lives together." Nokia is focused on transforming the dynamic between patients, doctors and the medical community with tools focused on the prevention of chronic conditions. Through its partnerships with some of the world's most renowned institutions in medical research and clinical trials - including Scripps, the University of Pennsylvania, the Mayo Clinic, the American Medical Group Association, Stanford MedX, Ochsner Health System and the University of Helsinki - Nokia is committed to collaborating with leaders in the medical community to positively impact societal health worldwide. "To face the global health crisis of chronic diseases related to lifestyle and behavior, we need powerful and engaging tools and solutions," said Nokia Chief Medical Officer, Matthew Diamond, MD, PhD. "Nokia is committed to shifting the focus from treatment to prevention, empowering consumers to take control of their health." Enhanced navigation for the discovery of content. New wellness programs to help users reach health goals based on their specific health and well-being needs. These programs, endorsed by medical professionals, take users on a multi-week journey with tailored content and recommendations that adapt to each user's progress over time. Five new programs including Sleep Smarter, Better Body (available for pre-order), Pregnancy Tracker, Healthier Heart and the Leaderboard are available on Health Mate to improve sleep, manage weight and fat mass, control blood pressure, manage weight gain during pregnancy, and get more active. Tools to visualize progress towards goals, leading to stronger outcomes. The new Nokia Health Mate app is available for download on iOS and Android app stores. Nokia Body is a new BMI Wi-Fi connected scale at an affordable price complementing the existing line-up of Nokia connected scales including Body+ and Body Cardio. Body offers smart weight management for the entire family and provides high accuracy measurements via Position Control technology, a patented body position detector. Weight Trend Screen: See progress during each weigh-in to stay motivated. BMI Insights: Instant access to BMI trend and data analysis over time to help users reach their goals. Automatic Wi-Fi Synchronization: Recognizes up to eight users with independent sync. Personalized Coaching: With the Nokia Health Mate app, users can personalize their goals within the app and track activity and food intake. Nutrition Tracking: Food tracking with MyFitnessPal. Body is available at health.nokia.com, Amazon.com and Best Buy and will retail for $59.95. Now featuring a soft cuff, Nokia BPM+ is a new, compact blood pressure monitor providing users with an easy, more comfortable way to measure their blood pressure at home or when traveling. BPM+ measures systolic and diastolic blood pressure and heart rate. FDA-cleared and medical CE approved, BPM+ ensures accurate monitoring of blood pressure and heart rate over time, and can share data with users' medical professionals to prevent, manage and monitor the efficacy of treatment for conditions such as hypertension. BPM+ is available at health.nokia.com and Best Buy and will retail for $129.95. The award-winning portfolio of connected health devices from Nokia marries next-generation sensors within beautiful, premium products grounded in human-centric design. Connected Scales: Nokia Body Cardio, the world's most advanced connected scale featuring heart rate monitoring and Pulse Wave Velocity to assess overall heart health; and Body+, a body composition Wi-Fi scale. Activity and Sleep Trackers: Nokia Steel, a sleek activity and sleep tracking smart watch; and Go, a simple yet advanced activity and sleep tracker. Blood Pressure Monitor: Nokia BPM, a FDA-cleared and medical CE approved wireless blood pressure monitor. Other Technologies: Nokia Home, a video and air quality monitor; and Nokia Thermo, a Wi-Fi and Bluetooth connected temporal thermometer. All products are now available online at health.nokia.com and select retail stores including Best Buy, Amazon.com and Bed Bath & Beyond. The products will soon be available additional retailers including CVS, Target, Babies"R"Us and Apple.